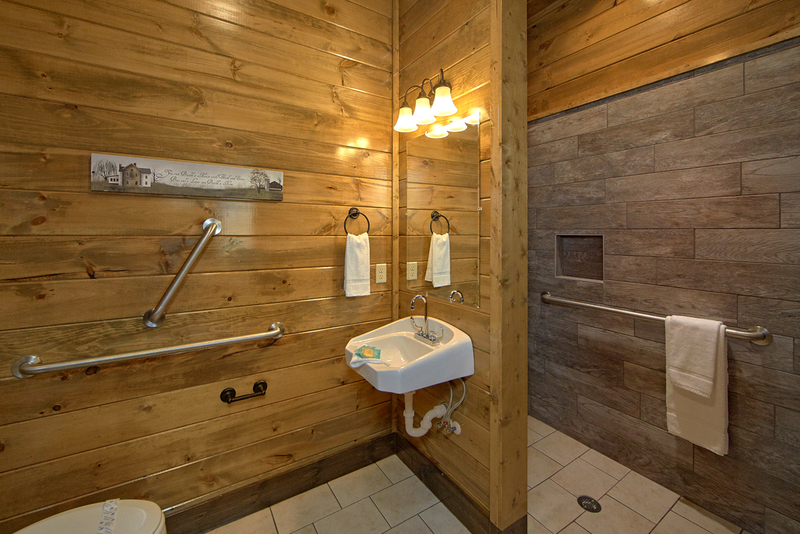 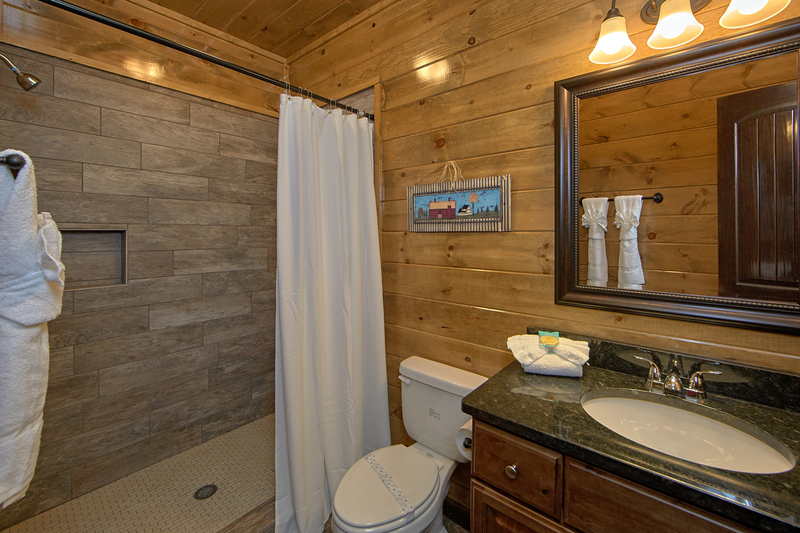 Experience luxury with this spacious designed cabin, SPLASH MOUNTAIN. 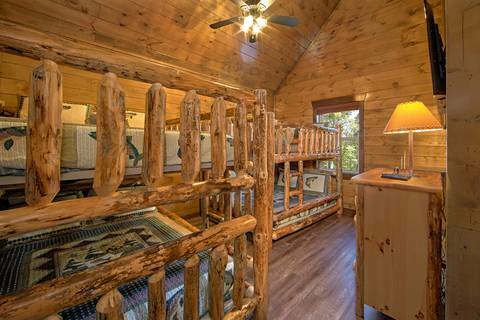 (SLEEPS 60 PEOPLE!) 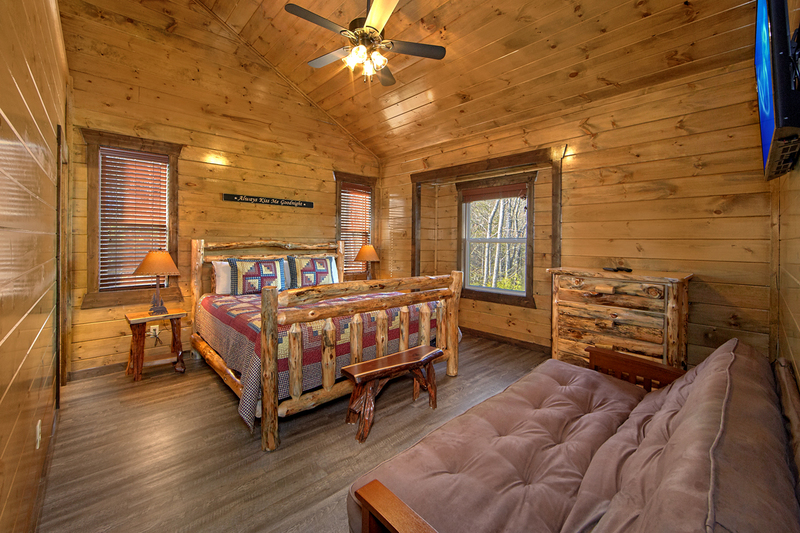 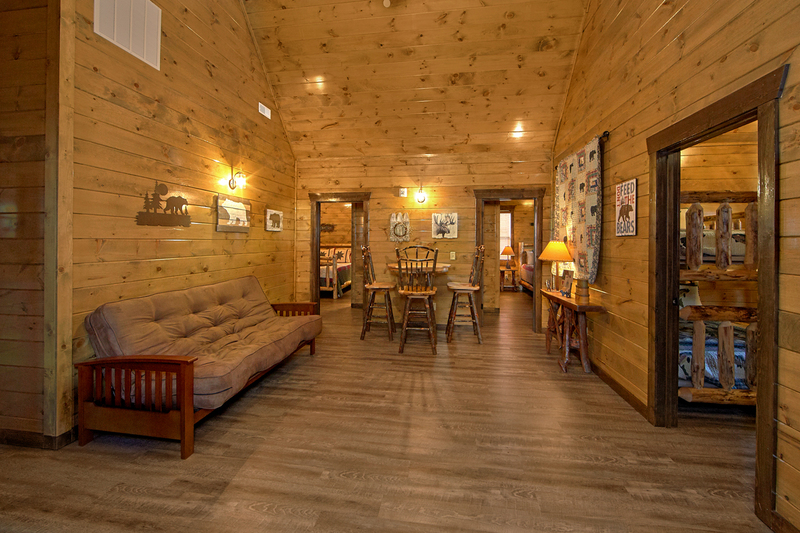 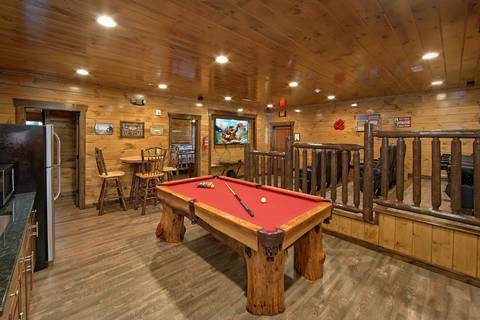 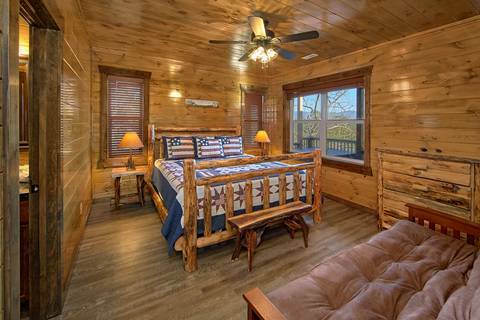 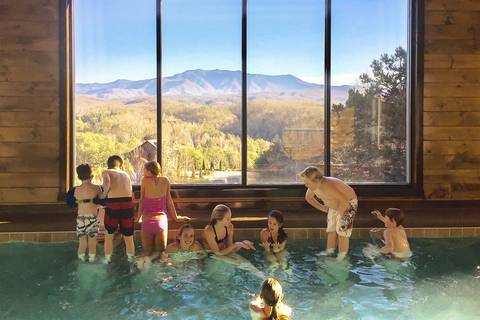 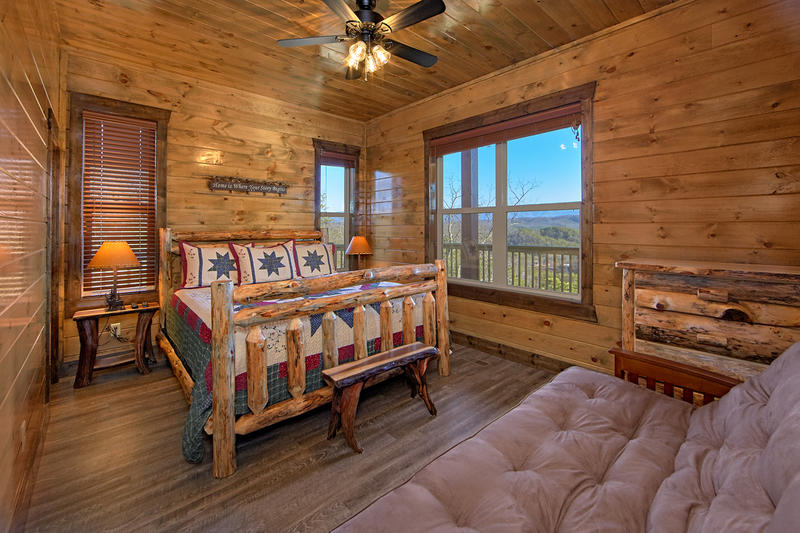 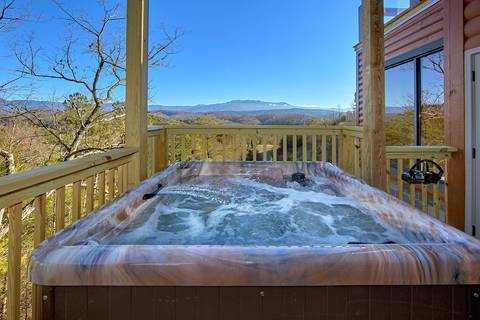 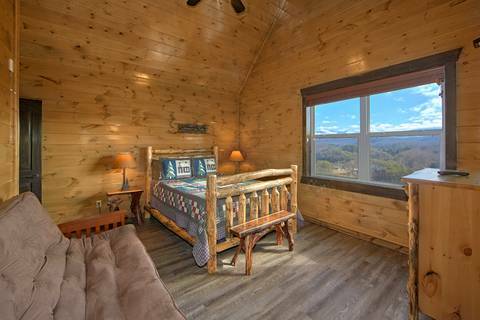 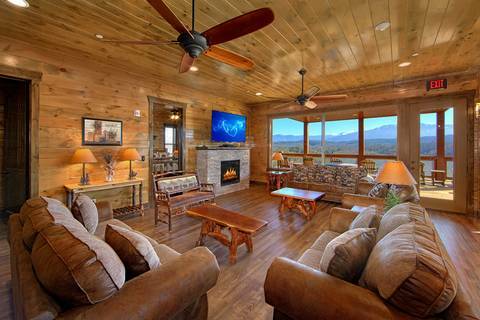 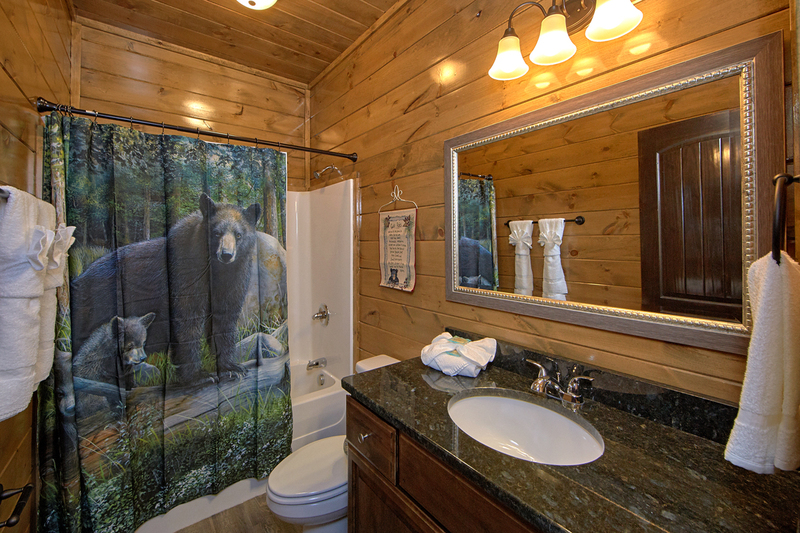 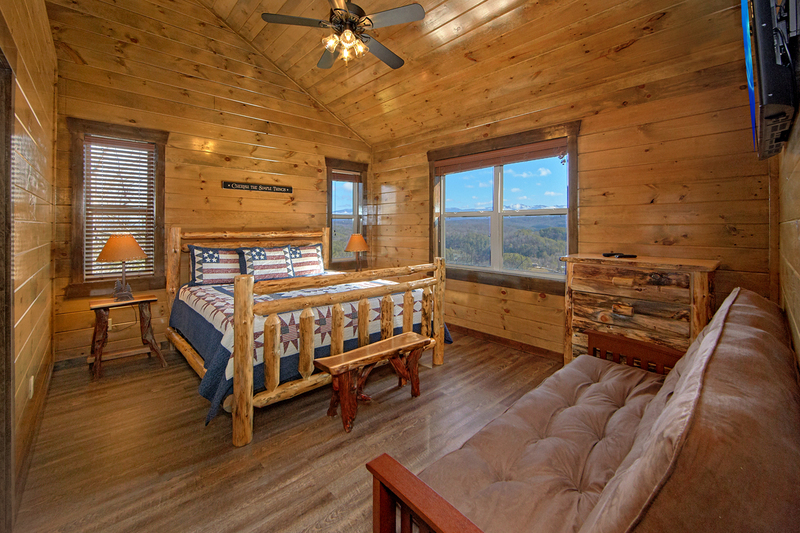 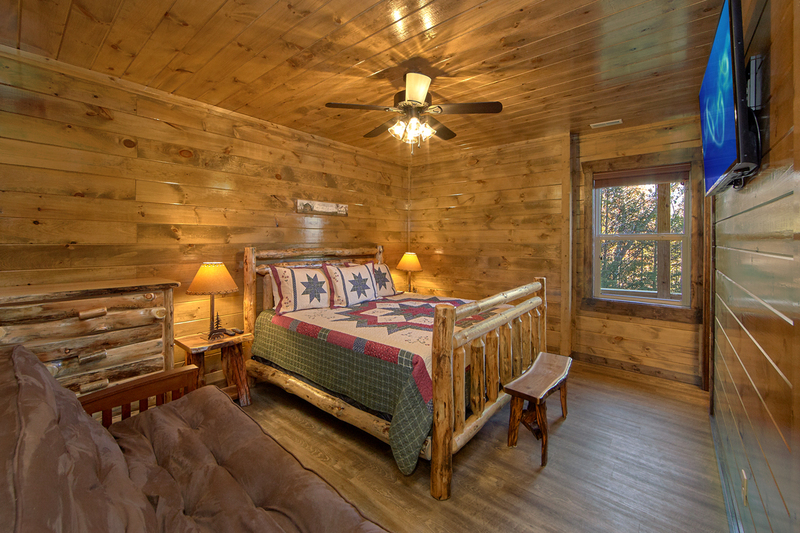 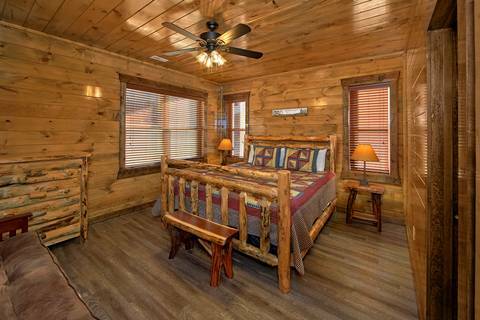 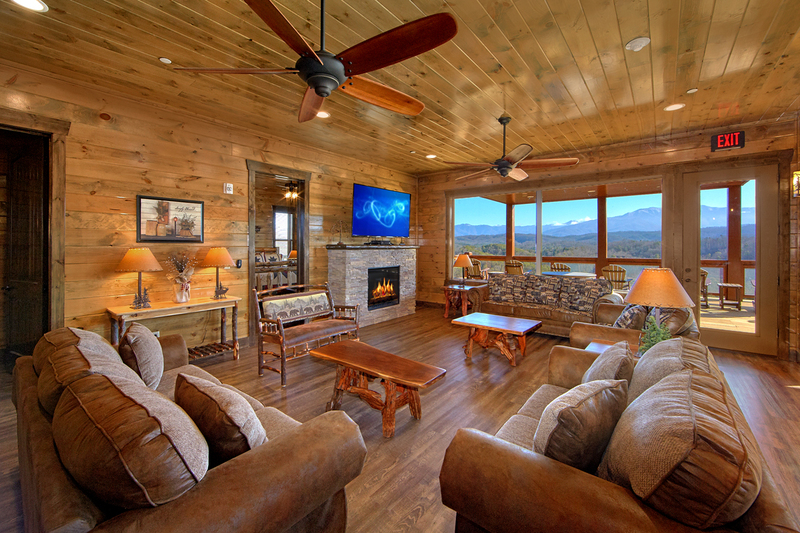 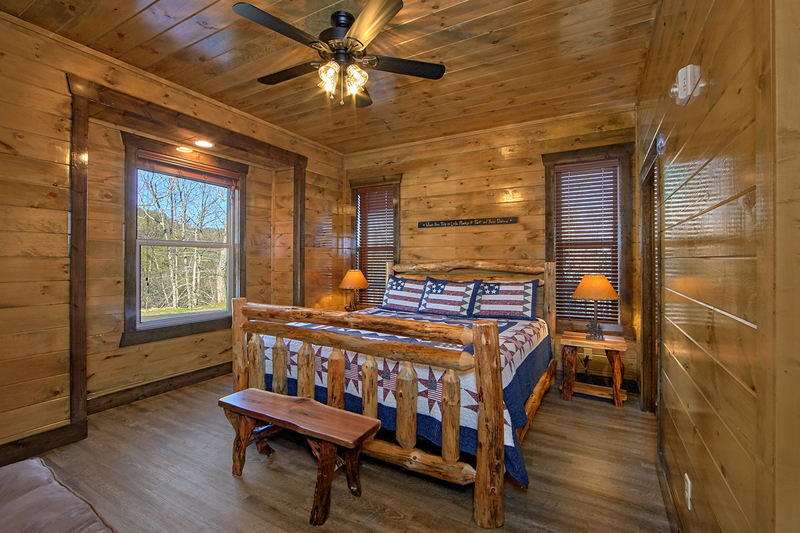 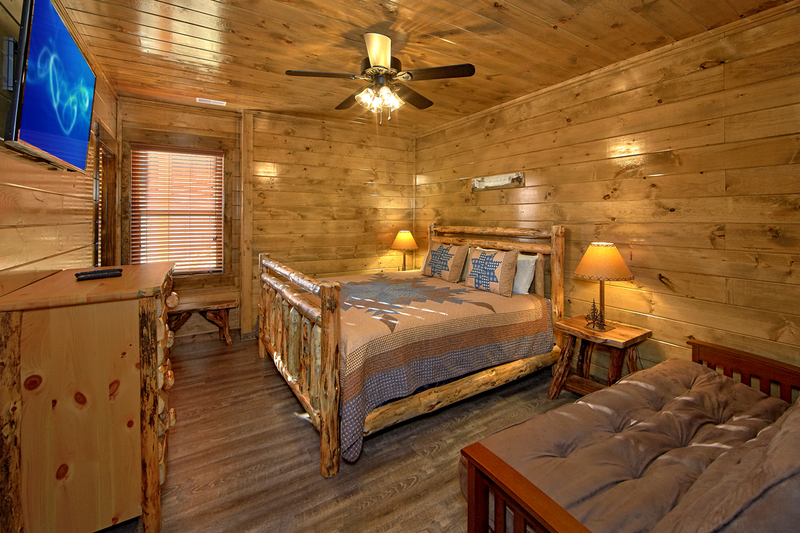 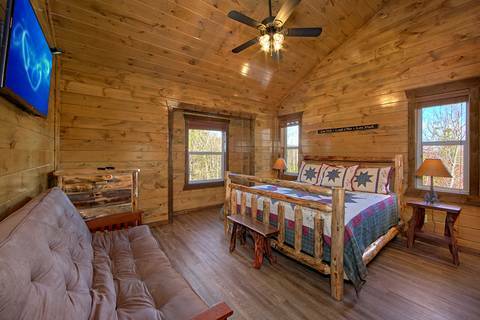 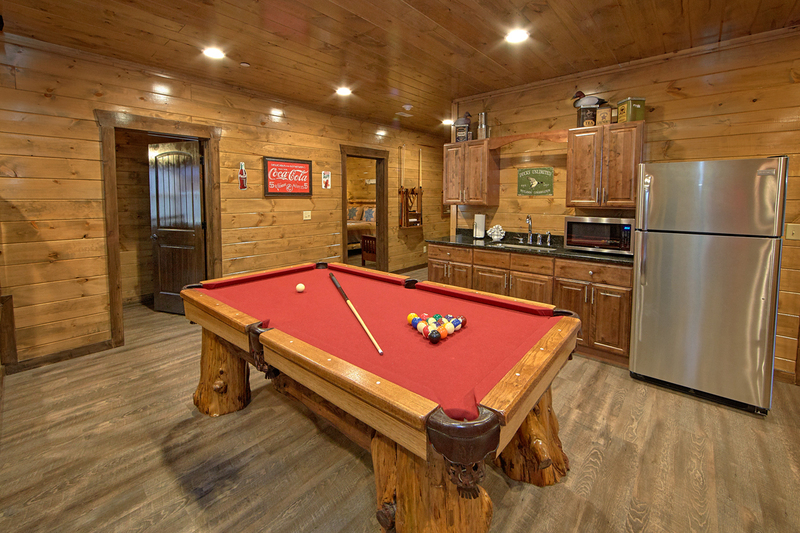 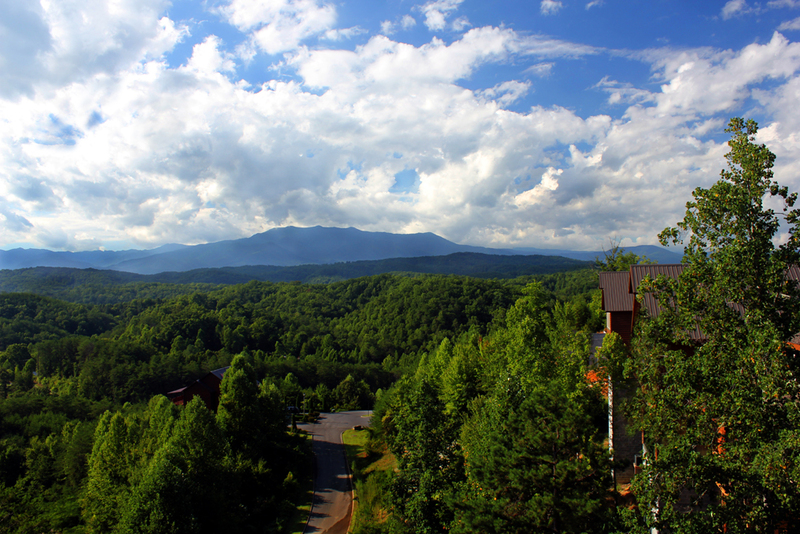 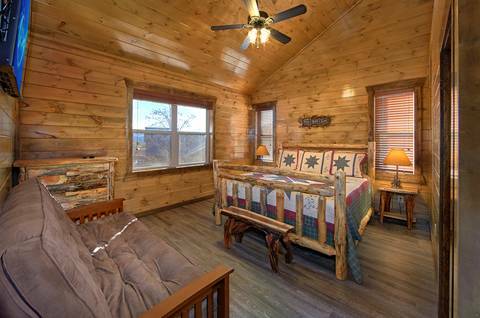 Located in the heart of the Smoky Mountains, this luxurious 13-bedroom cabin offers 3 levels of luxury and serenity and features a full sized indoor swimming pool! 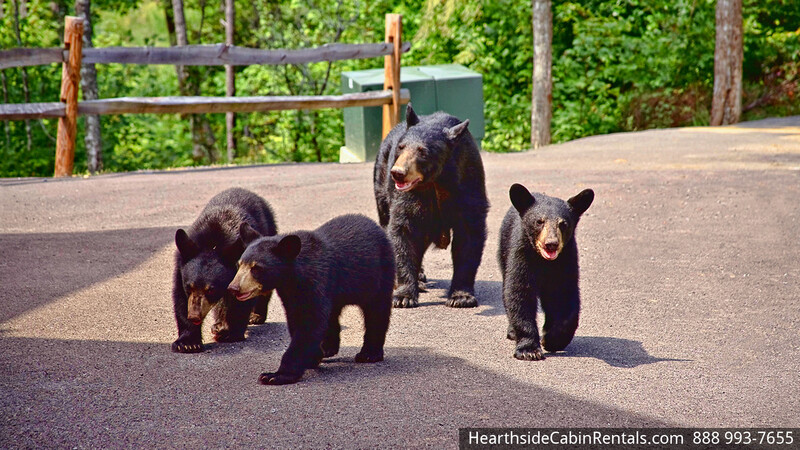 Bring the whole gang! 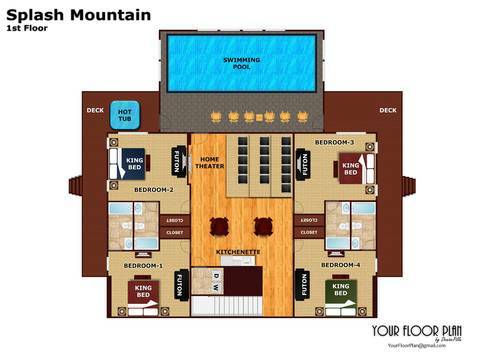 With flexible floor plans SPLASH MOUNTAIN allows you to travel comfortably in a group. So whether traveling with friends, a church group, or bringing along the whole family, SPLASH MOUNTAIN provides the ideal space for any large party. 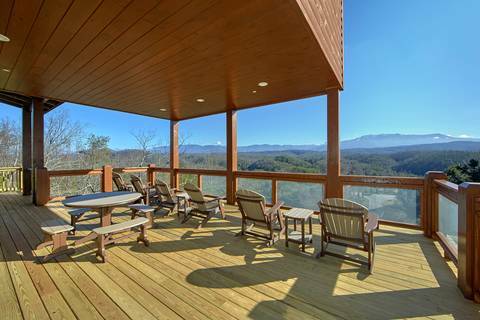 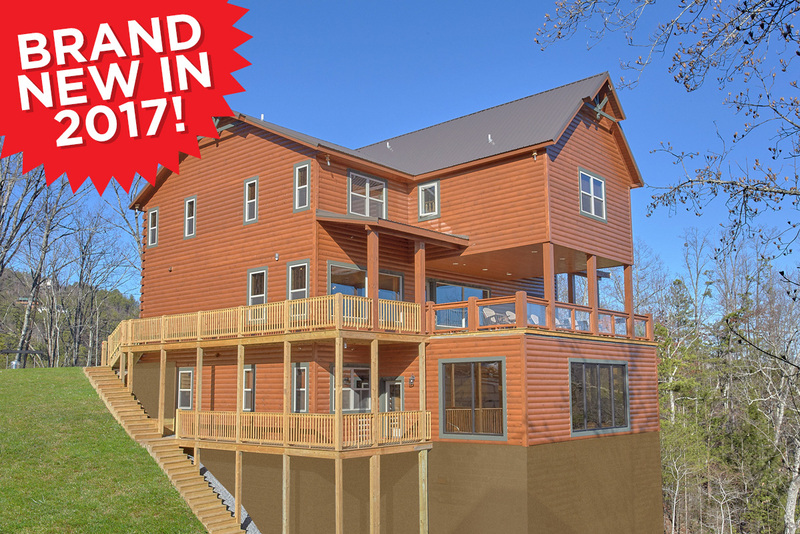 Bring your family, friends or event to Pigeon Forge and Gatlinburg this year and enjoy sitting deck overlooking the Great Smoky Mountains. 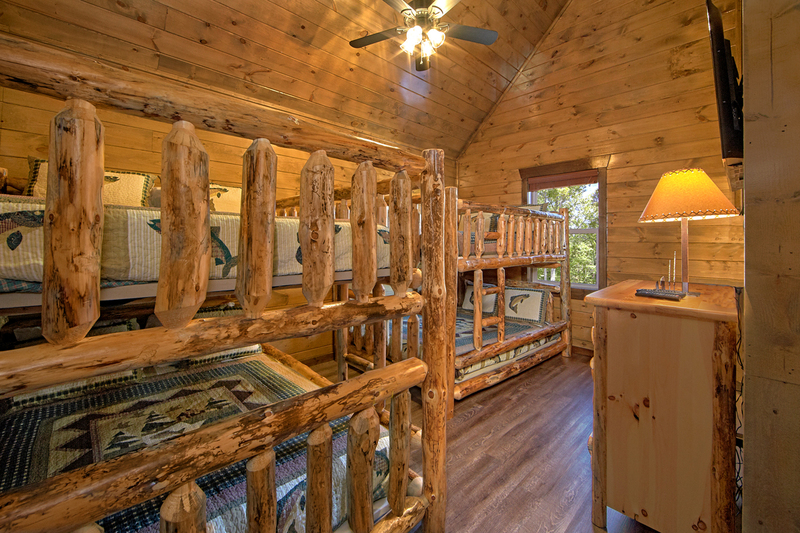 Upstairs Level - Let your large group spread out and relax with our spacious upstairs level -sleeps (36) with 4 King bedrooms/bathrooms, 1 Queen bedroom/bathroom (with futon in each), 2 bedrooms/bathrooms with 2 sets of queen-sized bunk beds. 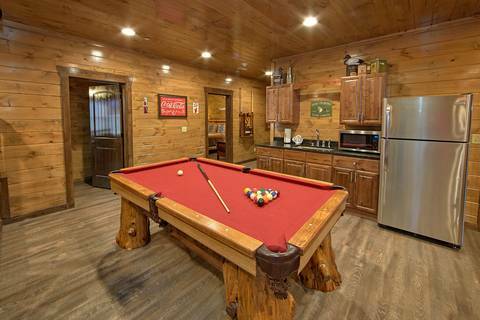 This makes a total of 7 bedrooms and 7 bathrooms on this level. Main Level- On the main level you will find 2 enclosed bedrooms with King sized beds, plus futons, and private bathroom in each, one which is handicap accessible – (sleeps 8.) This cabin has an open floor plan that provides a spacious kitchen and dining room and half bathroom. 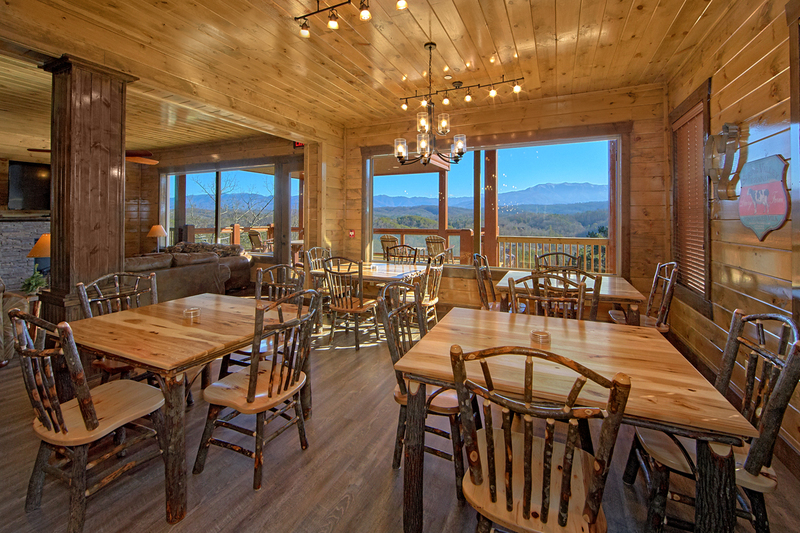 One of the biggest expenses on any vacation is dining out, especially for the entire family. 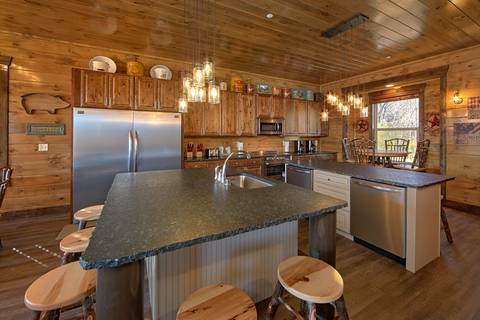 Knowing that three meals a day for the average family can do a lot of damage to the wallet, SPLASH MOUNTAIN is equipped with a spacious and well-appointed kitchen with a 5 burner industrial stove top with oven, that allows for easy and enjoyable meal preparation. 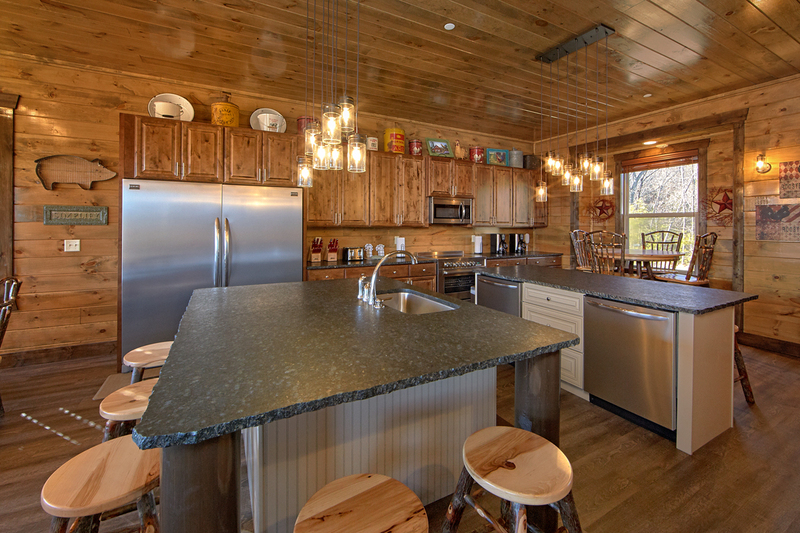 Clean up is a breeze with 2 dishwashers! This level features a huge covered deck with incredible mountain views that is the perfect setting for weddings and picnics. 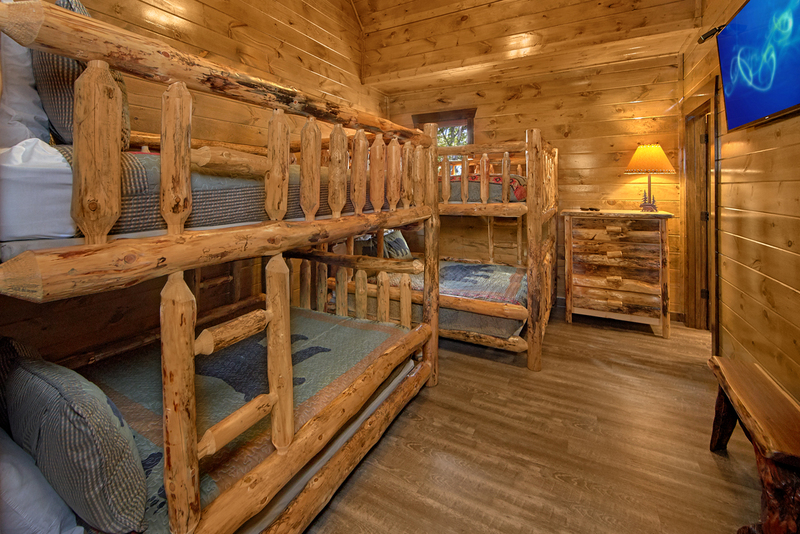 Lower Level- Your group can enjoy 4 enclosed king size bedrooms/bathrooms with futons in each. 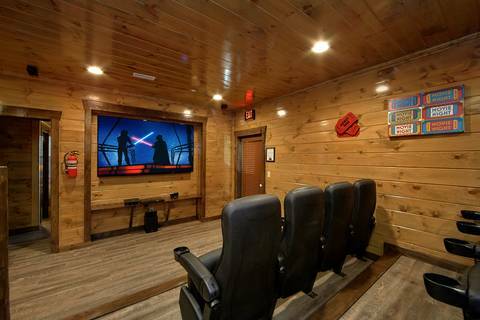 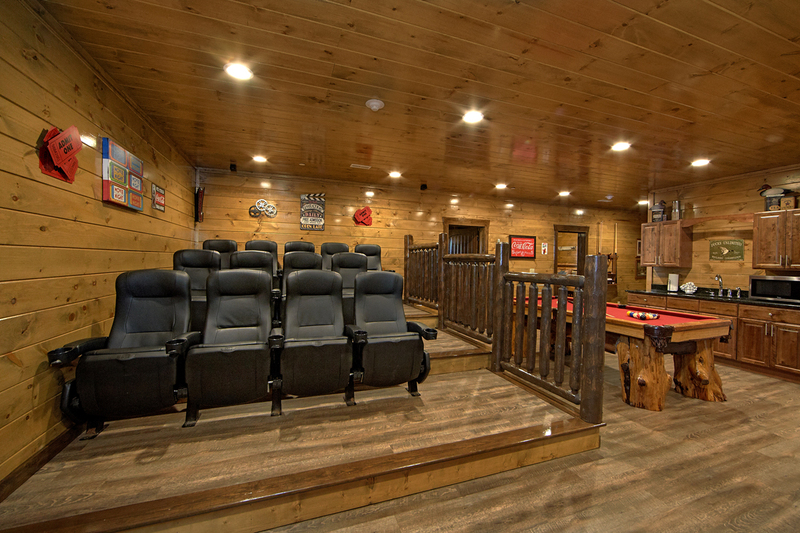 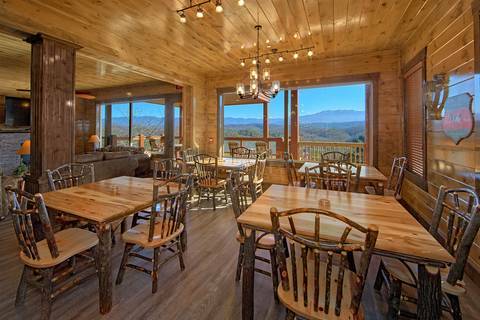 - (sleeps 16) An incredible ultramodern 16-person theatre room with theatre seating and an 80-inch-high definition TV, small kitchenette, refrigerator, sink, microwave washer/dryer room, and a hot tub overlooking the view of the Smokies on the back deck. A game room featuring a pool table is located on this level. 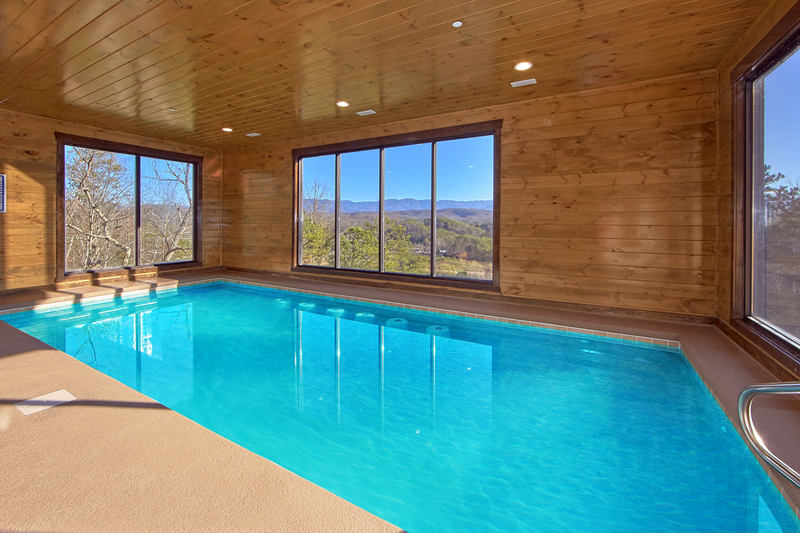 This level features a full sized heated indoor swimming pool that will allow swimming all year round! 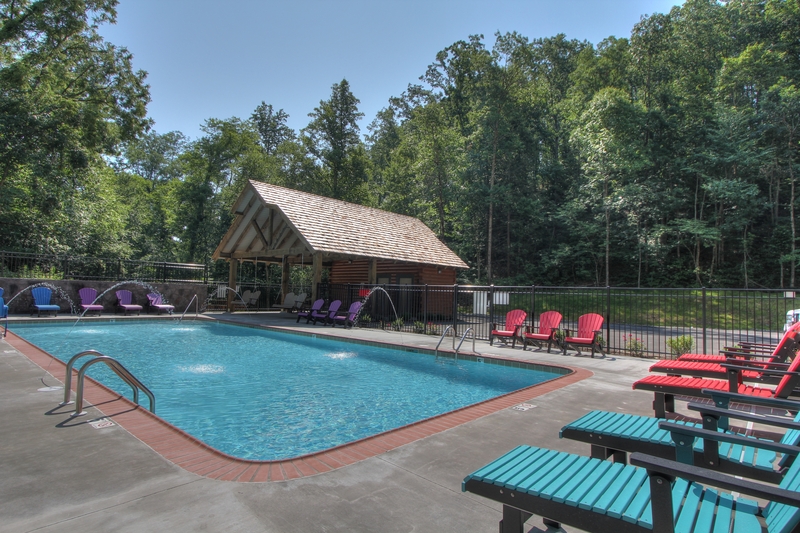 LUXURY SEASONAL OUTDOOR SWIMMING POOL AND PAVILION!